Thousands of prisoners across Turkey are on hunger strike. Kurdish MP Leyla Güven started the hunger strike while in prison. 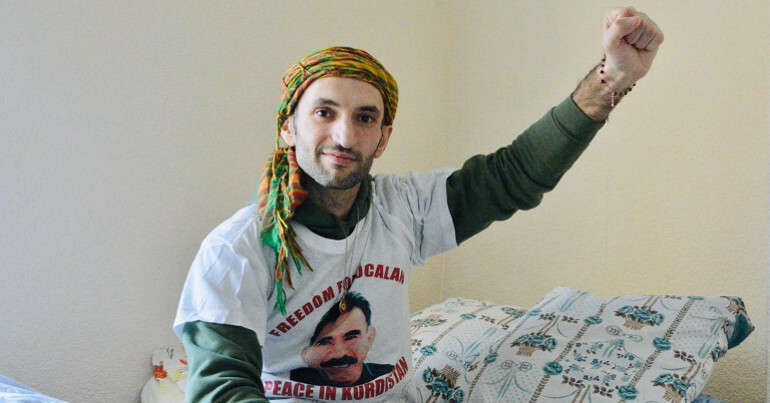 Now at home, Güven has not eaten for 148 days and is critically ill. 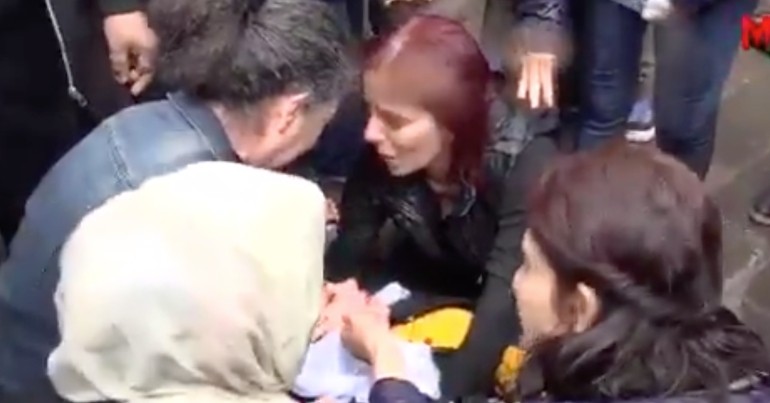 Since starting her hunger strike, Güven has inspired thousands to join her. 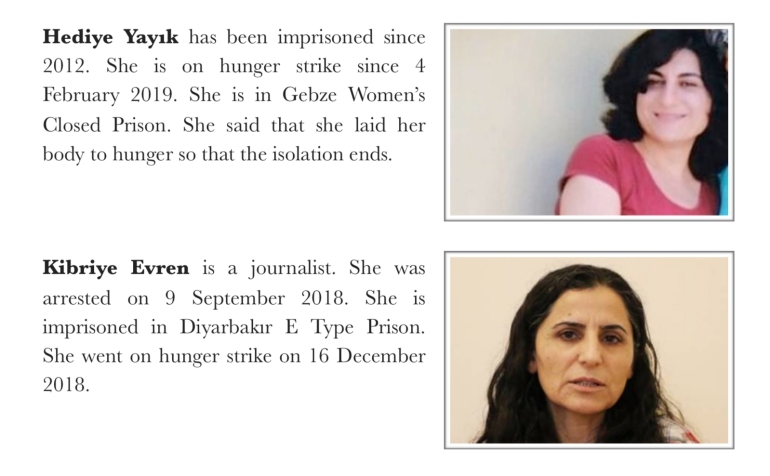 In the UK, these include Iman Sis, a Kurdish activist in Wales who is on day 109 of hunger strike and 87-year-old human rights lawyer Margaret Jones who has just joined the hunger strike. Now the Raise Your Voice for Leyla initiative has released a document to “see the person behind the numbers”. 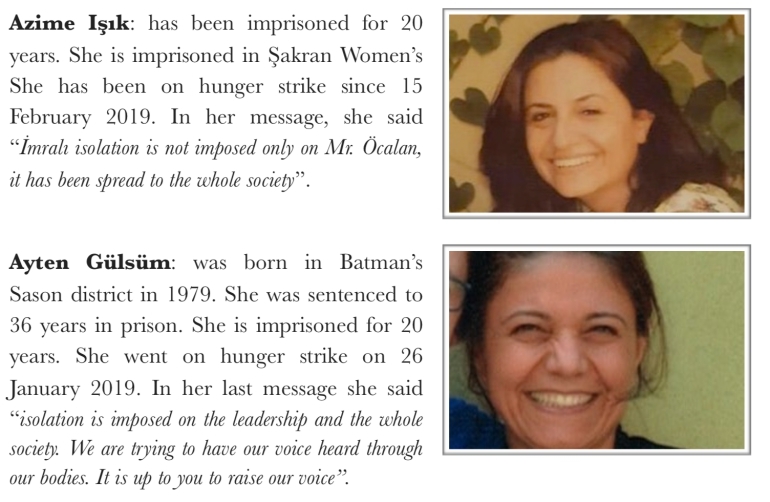 It gives short biographies of some of the prisoners on hunger strike and their “last messages”. 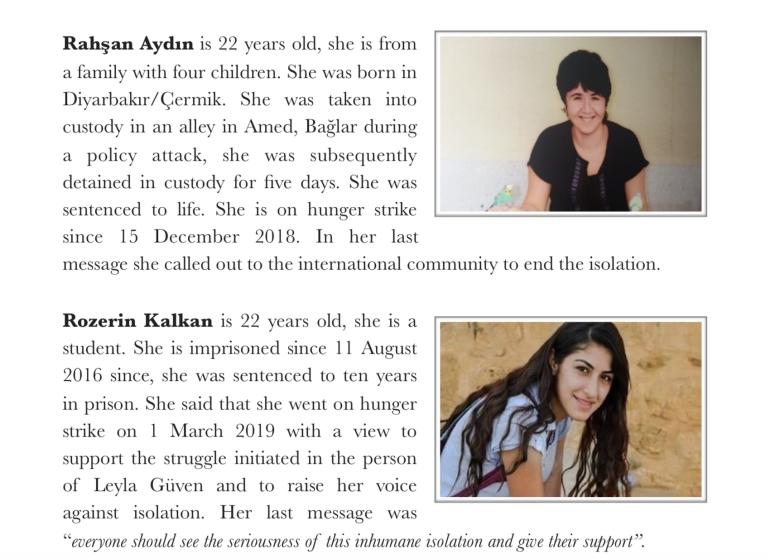 The indefinite hunger strike is calling for an end to Kurdish leader Abdullah Öcalan’s solitary confinement and to allow him access to lawyers and family visits. Öcalan co-founded the Kurdistan Worker’s Party (PKK), which has fought for Kurdish freedom and autonomy since the 1970s. He has been imprisoned by Turkey for 20 years. Turkey has defined the PKK as a ‘terrorist group’. Most Western states followed suit, as they see Turkey as a key trading partner and NATO ally. The hunger strikers are not asking for special treatment for Öcalan. They want to break his isolation. They want peace. And while Öcalan is held in conditions where he has no access to lawyers, to his family, to visits, there will not be peace. 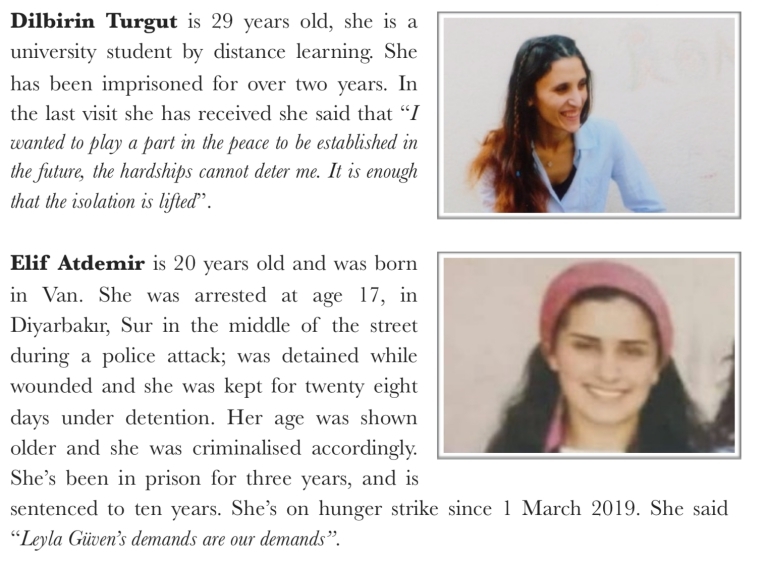 So the hunger strikers see their demands for Öcalan as a demand for peace. 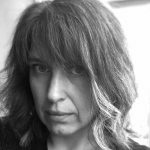 They want Öcalan to have the same rights as other prisoners in Turkey; rights that he should already be entitled to under existing Turkish law. They’re just asking for Turkey to respect its own legislation. Those on hunger strike in prisons are subjected to solitary confinement, those on hunger strike for a long time are not allowed to have people to accompany them, there are efforts to impede their communication with the outside world through imposing disciplinary punishments such as not allowing them to receive visits from family members, to make phone calls, to send and receive mail. They are subjected to physical and psychological violence. Reports of the Human Rights Association indicate that their blood pressure and weight are not regularly measured, they are not provided with adequate amount of salt, sugar, carbon, lemon, fruit juice and those in their possession are confiscated, and prices of such goods in prison markets are doubled. Those who have spent decades in prisons struggling against rights violations are at risk of irreversible damage. We believe that it is our humanitarian duty to present to you this document including short bios of prisoners who are on hunger strike and their last messages, and remind about humane conscientious, moral and legal responsibilities so that national and international dynamics are put into action with a view not to remain silent to and to put an end to this tragedy. You can read the full document and the testimonies of more prisoners here. Seven people have taken their own lives this year in protest at the isolation of Öcalan. 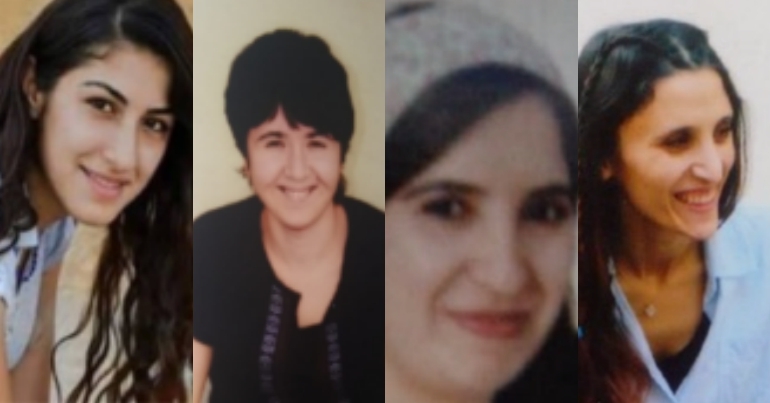 Six of them were Kurdish political prisoners in Turkish prisons. Siraç Yüksek was the latest person to take this action. 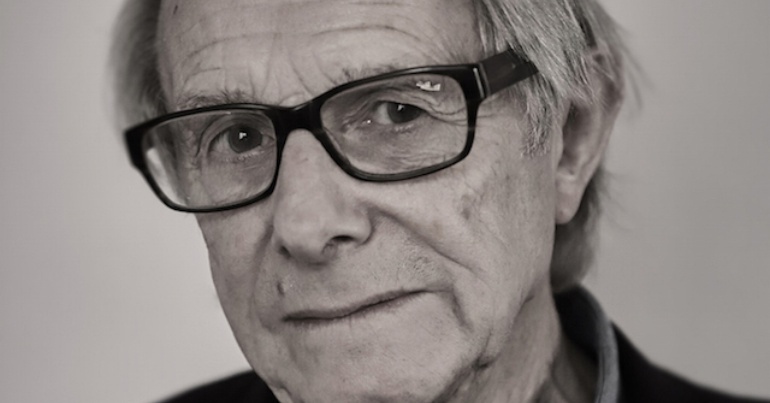 His death was reported on 2 April. 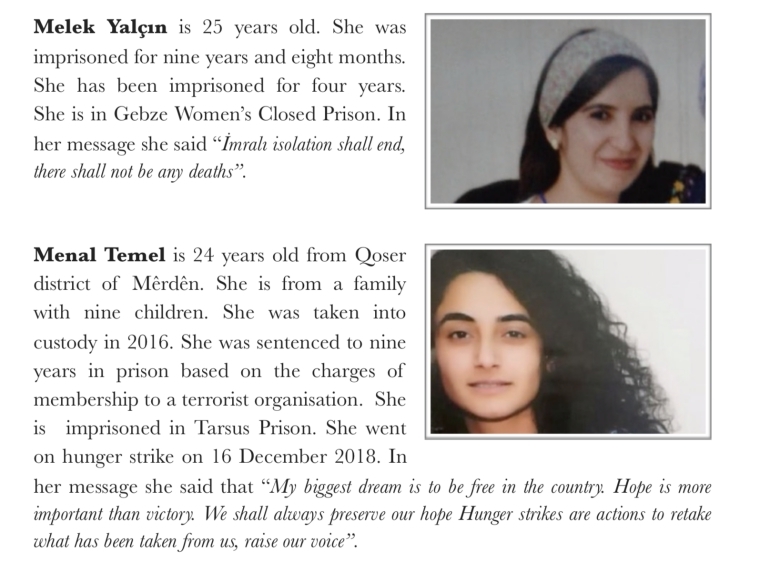 Güven and others have called for these suicide actions to stop, and for the movement to focus on the struggle of the hunger strikers. But time is running out. Güven’s health is deteriorating. These people do not want to die. They want the Turkish government to respect its own laws and end the isolation. This is urgent. This is not something that can be put off until tomorrow. Action is needed now. Join the upcoming demonstrations in support of the hunger strikers in London and Cardiff.